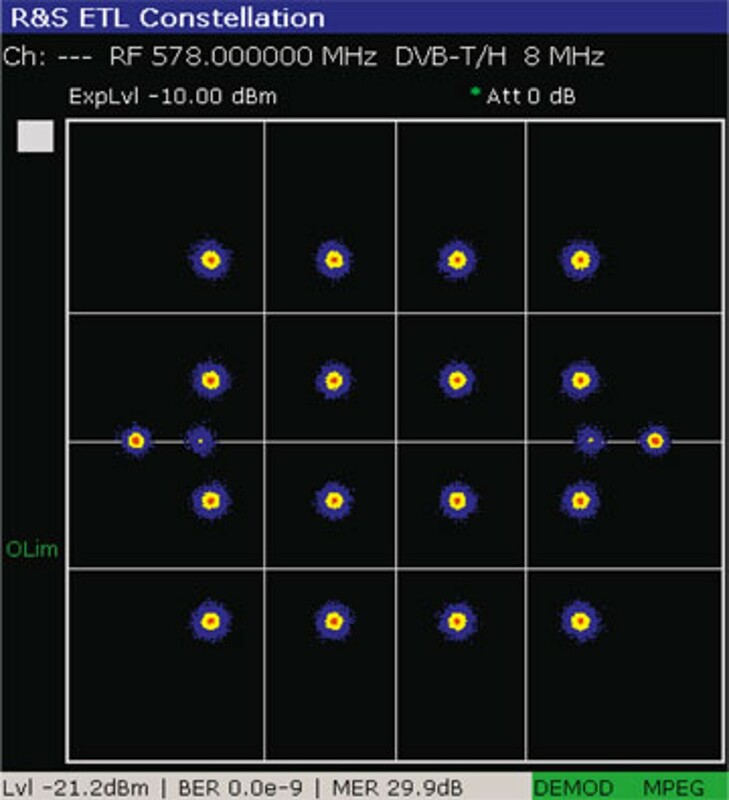 DVB-T signal quality is determined by measuring the modulation error ratio (MER). However, a poor MER does not indicate its causes since different interference factors overlap at the transmitter when a signal is generated and transmitted. 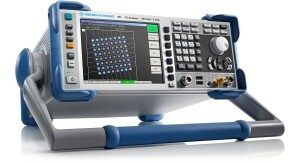 The R&S®ETL TV test receiver now has a unique new measurement capability that makes it possible to demonstrate to what extent the modulator's phase noise affects the MER. Whether as a manufacturer during development and production, or as a network operator during commissioning and maintenance – you need to test the quality of your DVB-T transmitters to ensure efficient and reliable TV coverage. You know that when an interference-affected signal is transmitted, the forward error correction (FEC) for DVB-T reaches its limits more rapidly than originally planned because the signal energy decreases during propagation. Coverage of outlying areas would only be possible at the expense of efficiency. A stronger FEC would mean a lower data rate and less program capacity. And increasing the transmit power would lead to additional operating costs. If the proven MER measurement shows that the quality of one of your DVB-T transmitters is not satisfactory, you will be particularly interested in finding out the causes in order to take appropriate measures. For network operators it is important that the transmit signal need not be interrupted for this analysis. The MER is a major quality criterion because it is a measure of the sum of all unwanted interference in the signal. It is normally impossible to break down each interference factor in the case of such sum error values. However, the R&S®ETL now uses a new measurement method (patent pending) to calculate the MER phase noise. This value is also given in dB but, unlike the general MER value, it is based only on the phase noise components. If this new measurement value is slightly better than the general MER value, then the modulator's phase noise is the dominant factor that impairs the quality. The new measurement method can even find the causes of phase noise itself. An integrated graphic shows the spectral distribution of phase noise interference. If, for example, interference is caused by mains frequency crosstalk on the modulator's internal reference frequency, it is immediately visible on the graphic as clear peaks at 50/60 Hz. Spectral analysis can detect much higher interference frequencies. The upper limit for an 8 MHz wide DVB-T signal in 8k mode lies between 446 Hz and 540 Hz, depending on the guard interval. In the 2k mode, even frequencies that are up to four times higher (up to 2.1 kHz) can be detected. The measurement example shows the effect of phase noise in the interference frequency range from 2.6 Hz to 446 Hz. 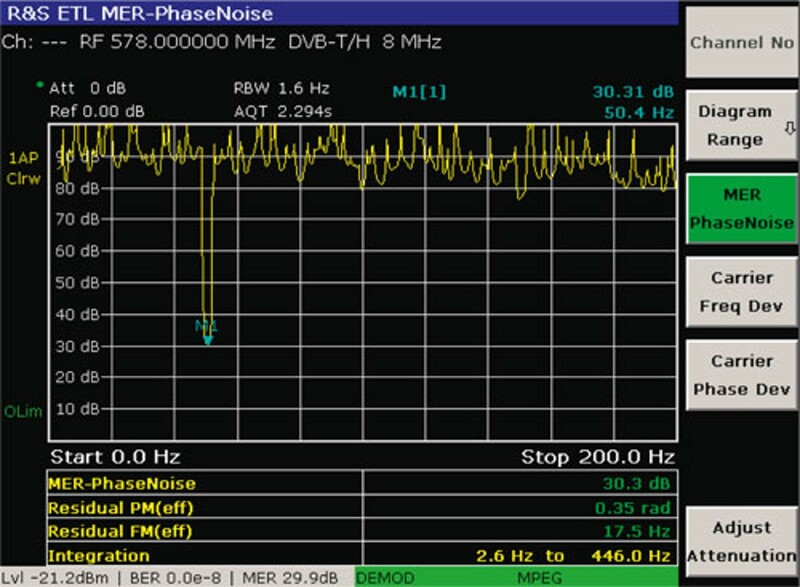 The total phase noise MER is 30.3 dB, as shown in the table in the screenshot. The spectral distribution of the phase noise clearly shows that the phase noise energy is at 50 Hz. Interference at this frequency correlates with the 50 Hz European mains frequency. In this example, corrective action needs to be taken. The test and measurement results are of valuable help. The new DVB-T MER phase noise measurement is available for all R&S®ETL analyzers at no additional cost as of firmware version 2.32 (under “Modulation Analysis”).